There have been many new prefilled THC oil cartridges for vape pens entering the market since legalization began spreading across America. It’s easier than ever to source highly potent, delicious tasting, cannabis oil in pre-filled cartridges. The demand for easy, mess-free prefilled cartridges is quickly surpassing all other types of vaporizer products. Nobody wants a tabletop like the Volcano anymore, and many people don’t want to mess around with filling the cartridges with the product themselves. Cannabis lovers are demanding pre-filled (or disposal) cartridges for ease of use, and time savings. We tried out the most popular THC cartridges on the market today, to find out which ones lived up to the hype. After trying out 10 of the highest rated cartridges on dispensary shelves, we compiled our recommendations into one go-to list. The first factor is its capability to produce smooth billowing vapor clouds. There is no more room on the market for a harsh hit. The second factor is the quality and strength of the extracted cannabis oil. The high and the taste must meet our standards. The third requirement for a great pre-filled pen is an affordable price. Lastly, we wanted to make sure there was a level of quality control over the extraction process. Many companies today are finding it hard to pass the government mandating testing. The best attractions are free from pesticides, chemicals, and other toxins. 10. Dosist Vape Pen – Has advance cannabis oil and terpene formulas. Our list of the best vape cartridges from 2018 starts off with a fan favorite from Dosist, formally known as hmbldt. This company is based out of California and offers controlled dosage vape pens explicitly targeting medical issues. This disposable pre-filled vape pen has been written about in Time magazine, listed as one of the 25 Best Inventions in 2016. Dosist are working to advocate for cannabis rights around the world, especially in Canada. What makes these THC oil vape pens different than others in the industry is their unique scientific formulas. 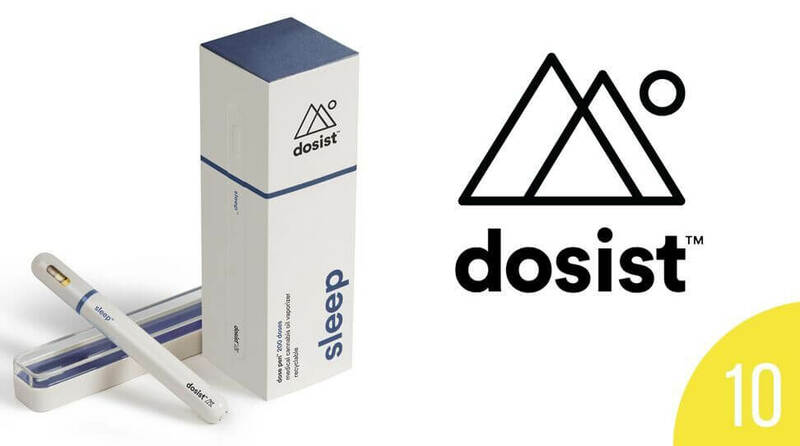 Dosist targets certain cannabis compounds to create a product geared towards improving multiple types of health and wellness issues. Some prefilled cartridges are geared towards sleep, others towards happiness, and even others are about producing the sensation of calm. Unfortunately, not all dosages felt the same when trying out the various types of Dosist vape pens. Some were tastier then others. The product itself failed to provide a potent vaping experience, but this is likely because it’s built as a medical device and not a recreational vaporizer. The Dosist pen is not for those looking to get baked, in fact, we would only recommend a Dosist for those seeking therapeutic advantage. During our testing phase, we also discovered a flaw, the battery of one of the vape pens died before we finished the oil inside. Out of the five Dosist strains we tested, only one battery died before we finished with the pen. We did love the packaging though, as its some of the slickest in the industry: stylish, sleek, and professional. If you prefer micro dosing throughout the day and don’t mind a lower THC pre-filled cartridge, this pen might be for you. The formulas are carefully crafted to suit the needs of their customers. 9. VVS Vape Pen – Disposable prefilled vape pen with potency. 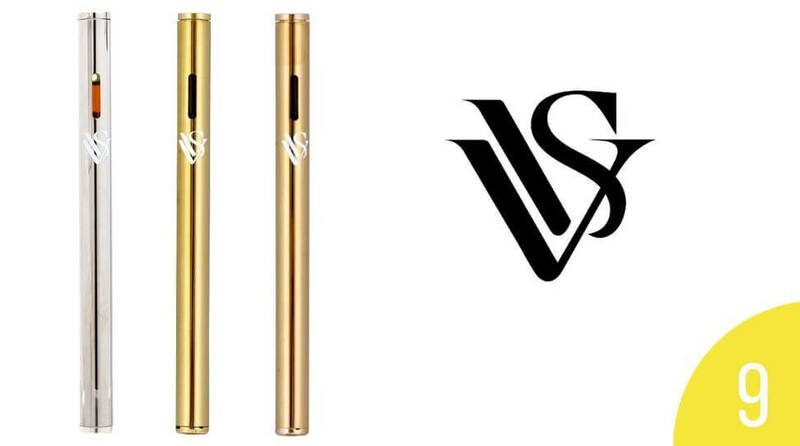 The VVS Vape Pen is marketed as a luxury disposable THC oil pen. Its average cost is $40.00 plus tax. Three color options are available which include gold, silver, and copper, all leaning towards the higher end of vape pen aesthetics. VVS vape pens are designed to be discreet with a fragrance that is not identifiable as cannabis when vaped. When vaped, you’ll quickly notice this taste different from other pens on the market. Its noticeably not-cannabis based, and has a slight artificial aftertaste. While purists might not like the chemical flavor-profile, they may still love this product for its potency. We did eventually come to enjoy the vaping experience, although the taste took us a moment to get accustomed to since we typically love to taste of cannabis terpenes. VVS vape pens are great for discreetly vaping almost anywhere: at work, while driving, or in your room. It’s a minimal design, with no buttons on the device at all. This disposable pre-filled vape pen only requires you to pick up and inhale. The potency is what makes this vape pen stand out though, and what accounts for the relatively high price point. Was it worth it? Well, it made it on our Top 10 List, although it sits at number nine. 8. 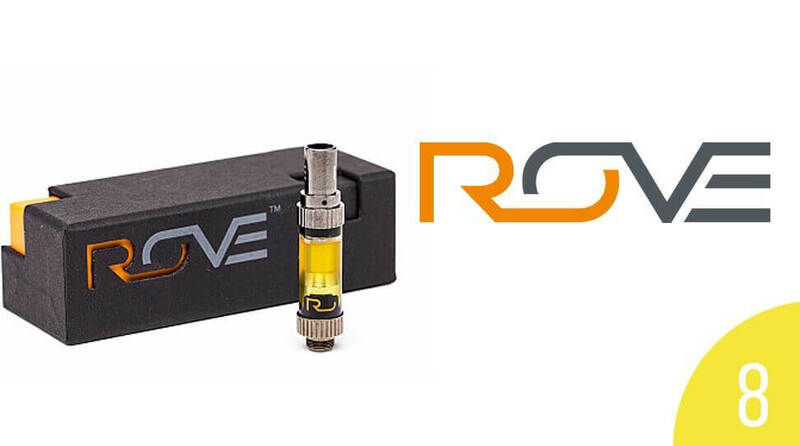 Rove cartridge – Super strong THC oil with a weak cartridge. Rove brand cartridges use pure-California grown cannabis as a base material for their powerful extractions. The average price for a Rove cartridge is $35.00. Unlike other pre-filled vape pens which rely on toxic butane or ethanol extraction methods, Rove uses CO2 extraction, one of the cleanest methods used in the industry today. When there are a lot of pre-filled vape cartridges failing to pass third-party testing for solvents and pesticides, you’ll want to go with a company you trust. 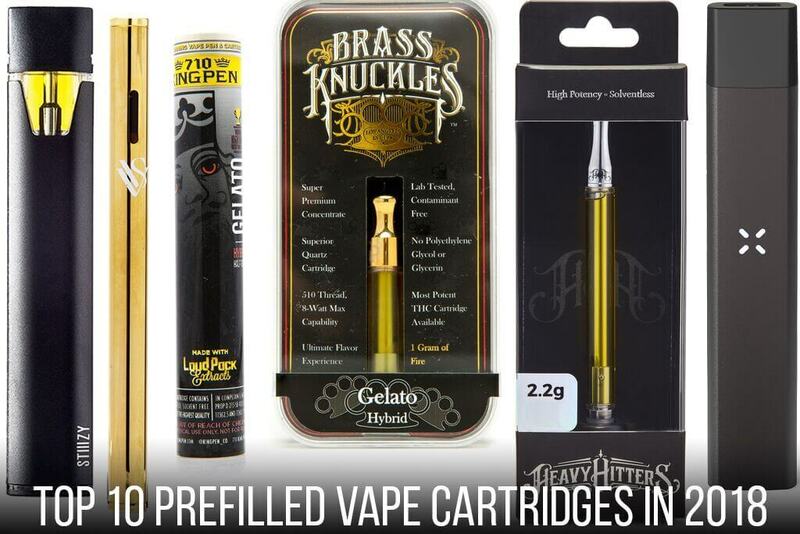 Rove has some very potent extracted cannabis oil in their cartridges. Unfortunately, the Rove pen design may need some tweaking in future. We found that the pen didn’t effectively vaporize the thick, resinous oil in the cartridge. Depending on the environmental conditions around you, you might find its hard to get the most out of this product. With a little ingenuity, we used a lighter hovered over the surface of the cartridge to melt the oil inside. While this method worked, it wasn’t ideal. Once the Rove cartridge THC oil becomes liquefied, it’s possible to vape large clouds, so thick they obscure the room. If you live in California, where the climate is ideal for keeping the oil liquified, leftover resin won’t be an issue. Otherwise, check out some of the other options on this top 10 list. The Pax Era Pods are cartridges designed to avoid frustrating leaks and sticky messes. Pax Era battery is affordable at $19.99, which helps make up for the fact that their cartridges (called Pods) fall at the higher end of the price spectrum. Some Pods are as much as $50 each. We loved the sheer variety of the available Pods, with over 250 strains and 50 extract partners producing the concentrates. Whatever you crave in a vape product, it’s like Pax Era has one for you. The miracle of the Pod design is ease of use, its an interesting quick snapping system, no complicated installs needed. Pods can easily be snapped on and off from the vape battery. This feature is much more efficient then screwing on a 510-threaded cartridge. The design of the Pax Era is discreet because it doesn’t look like your traditional vape pen. Another great feature is the ability to vape without having to press a button. Inhale, and suddenly you are vaping. 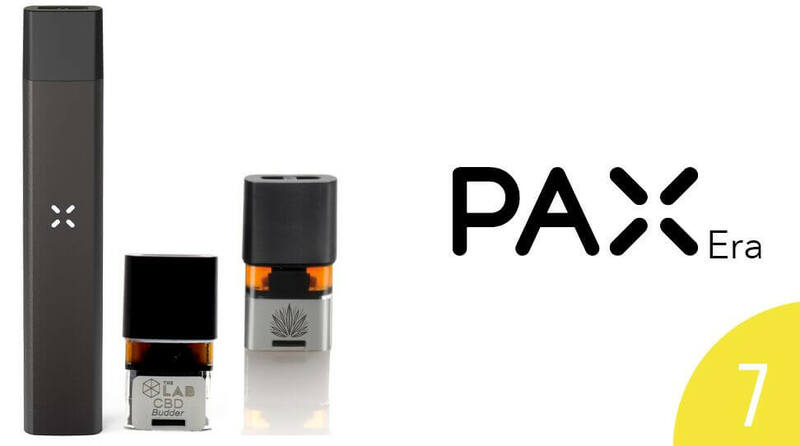 Pax Era vape pen and the pre-filled cartridges might not come with much control on the device itself, but Pax Era has a connected mobile dose management app. The app helped us manage our preferences for the entire experience, including temperature and time. We could cater it to different strains, figuring out which settings produced the best high and most extensive vapor cloud. We loved the dosing app for the hands-on approach, even if the Pax Era pen didn’t need any hands at all.